Long before many other laptop vendors began experimenting with netbooks and ultraportables, Sony was making skinny, lightweight laptops--many with small screens, most of them rather pricey. 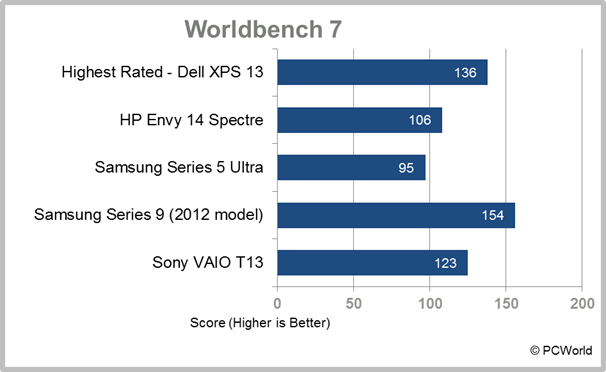 Its first Ultrabook, the VAIO T13, is neither exceptionally small nor expensive at a starting price of $799 (as of June 4, 2012). With its decided consumer bent (including hybrid storage), it shapes up as a laptop worth considering if you just want to dip your toe in the Ultrabook category and avoid full immersion. Outfitted with a 13.3-inch, 1366-by-768-pixel widescreen display, an Intel Core i5-3317U CPU and its companion HD4000 graphics hardware, 4GB of RAM, and hybrid storage (a 500GB hard drive cached by 32GB of flash storage), the VAIO T13 earned a respectable score of 123 on WorldBench 7, and a mark of 77 in overall performance (including battery life and game performance). That's about what you'd expect from an Ivy Bridge configuration with hybrid storage instead of a full solid-state drive. It's worth mentioning that a couple of laptops with previous-generation Sandy Bridge CPUs and solid-state drives scored better, reflecting the impact on benchmarks from data-transfer speeds between drives and memory (as opposed to raw computing power alone). People who keep a lot of applications and files on their computer will appreciate the roomy hard drive--and for many tasks, you're not sacrificing huge performance gains to get it. In fact, the T13 turned in above-average scores on office productivity, Web performance, and most content-creation components of WorldBench 7; it lost ground, however, in storage-related tasks (file copy, paste, and compression), where that poky hard disk clearly came into play. Startup time (around 18 seconds) and battery life (about 6.5 hours in our tests) are both good, as we'd expect for an Ultrabook with a hybrid drive. Gaming scores, too, were generally average for the class. 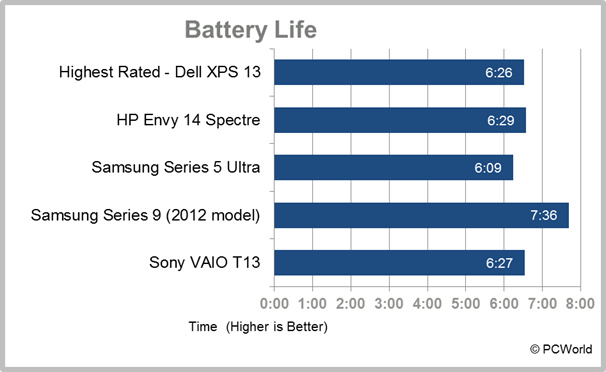 Sony touts the T13's ability to sleep for up to ten days, but we weren't able to test that claim. 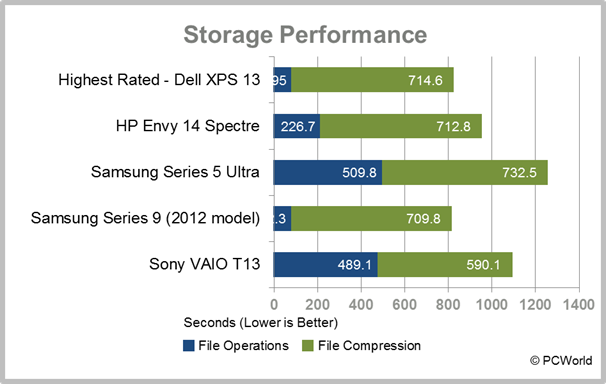 In short, you don't get performance bragging rights with the T13, but unless you perform a lot of hard-disk-intensive file operations, there's little cause for complaint. Also, you could probably get a little more speed out of the T13 by adding extra memory; Sony lets you expand the default 4GB to up to 8GB, an option you don't always have with an Ultrabook. Physically the T13 takes some of its design cues from, predictably, the MacBook Air--most notably the champagne color of its case, made of a brushed-aluminum lid and magnesium everywhere else except for the plastic bezel. However, Sony opted for more-squared edges all around, giving the T13 a somewhat chunky feeling even though its 0.8-inch thickness is about average for the category and its 3.4-pound weight (without accessories) makes it a few ounces lighter than the average ultraportable (but a few ounces heavier than the typical Ultrabook of this size). The T13's touchpad is clickable and supports multitouch operations such as pinching and zooming; I found it pleasingly responsive and easier to use than touchpads that don't give you the tactile feedback of a light mechanical click. The keyboard is less impressive: While the keys are sufficiently large and well spaced, they're almost completely flat and have little travel. Some sculpting would have been nice. Sony places three small bar-shaped buttons atop the right half of the standard QWERTY layout. The leftmost button, labeled Assist, affords access to VAIOCare, Sony's self-guided help and troubleshooting app. The second button launches your default Web browser, and the third (labeled 'VAIO', somewhat enigmatically) can launch whatever application you want, although by default it asks you to choose between VAIO Media Gallery or PlayMemories software for managing and playing multimedia. Another unusual interface option is VAIO Gesture Control, technology that uses the built-in 1.3-megapixel video camera to view hand gestures for controlling navigation and other functions on supported apps--Internet Explorer 9, Media Gallery, PowerDVD, PowerPoint, and Windows Media Player, according to the documentation. In my tests, after going through the tutorial and initial setup, I was unable to get this feature to work. The camera had a tendency to shut itself down for no apparent reason, and even when the camera was active, nothing happened when I tried to scroll through a PowerPoint presentation by waving, or when I attempted to pause or change the volume on a Windows Media Player song. The documentation offers a number of reasons why the technology might not work, ranging from poor lighting to too much or too little distance between your hand and the display, but a feature that's so difficult to deploy is probably not quite ready for prime time. The T13 does have decent multimedia chops, however. The audio system, as enhanced by Sony, produces satisfyingly full-bodied sound, and video plays smoothly. The screen offers good visibility from side to side, although the result isn't quite as good when you move up and down. The aforementioned USB camera provides a range of controls to help you get the lighting, hue, and exposure into shape. Unfortunately, the images it captures can become a bit blurry if you move around a lot; frequent Skype callers should still consider investing in a higher-quality webcam. Sony packed in some connectivity hardware that you don't always get with an Ultrabook, including HDMI and VGA ports, plus a reader for SD and Memory Stick cards, all along the right edge of the T13. More typical are the pair of USB ports (one 2.0, one 3.0) located on the left edge, and the gigabit ethernet port and headphone jack situated on the right edge. In addition to Bluetooth 4.0, the T13 supports 802.11n Wi-Fi--but only on the crowded 2.4GHz band. For a city dweller like me, living in a neighborhood with several dozen 2.4GHz networks competing for a mere three nonoverlapping channels (not to mention the potential for interference from Bluetooth, microwave ovens, and some cordless phones), a network based on the much wider 5GHz band would almost certainly be an improvement. Sony's software bundle is filled with gadgets such as the previously mentioned PlayMemories and VAIO Gate (which creates a customizable dock at the top edge of the display), but none are particularly superior to the free Windows alternatives. (Remember, you can already set up easy access to apps and pages you like by using the Windows taskbar.) You get a 30-day trial of Kaspersky antivirus and the starter edition of Microsoft Office, too. In general, the Sony VAIO T13 straddles the blurry lines between all-purpose, thin-and-light, and Ultrabook portables with reasonable skill. It compromises a bit on performance due to the hybrid drive, and some of the ergonomics could be better, but it delivers the lightweight design, the fairly roomy storage space, and (except for its lack of 5GHz Wi-Fi) the various connectivity options that are popular with consumers--all at an uncharacteristically (for Sony) affordable price. People who like the idea of an Ultrabook but don't want to sacrifice a lot of traditional features should give it a look. The Sony VAIO T13 delivers most of what you expect from an Ultrabook with some popular consumer features at a surprisingly affordable price.